Recurring bits on The Late Show With Stephen Colbert: A guide to the new canon, from the Big Furry Hat to Big Questions With Even Bigger Stars. Colbert’s recurring segments include Big Questions With Even Bigger Stars, the Hungry for Power Games, and the Big Furry Hat. Now, three months into Stephen Colbert’s tenure on The Late Show, he’s already amassed an impressive array of his own recurring bits—ones that tell us a lot about what kinds of comedic targets most interest Colbert as a host (namely: the Internet, religion, and bad political opinions). But some of these are more interesting than funny, and some of them are smart conceptually but just don’t work in execution. So, like the Republican presidential campaigns he’s so fond of mocking, not all of these bits are built to last. 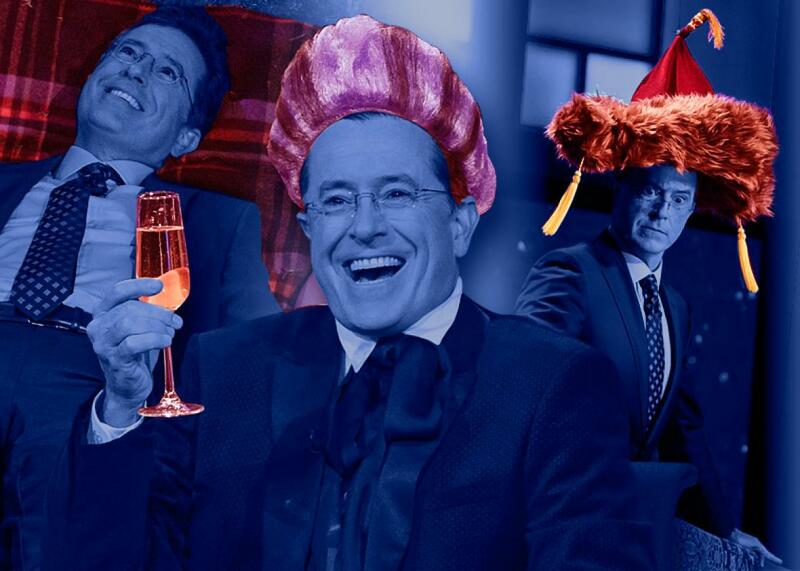 On the precipice of 2016, here are the recurring segments that have so far defined The Late Show With Stephen Colbert: a show that’s proven to be an earnest, often-introspective look at both the nature of late-night and Colbert himself. In this bit, an enormous, tasseled hat descends from the ceiling and lands on Colbert’s head. The hat is an outward signifier of authority, allowing Colbert to issue proclamations that automatically become law. (“If someone gives you the finger, you get to keep that finger.”) The pronouncements made from under the hat’s brim can be as reasonable as defending the practice of ghosting from parties or as far-fetched as demanding that movies be just as good as their trailers, but they all align in presenting the world the way the Colbert-watching populace feels it should be. After all, Colbert is a benevolent dictator. (Also, John Cleese recently showed up with his own furry hat to engage in combat by headwear with Colbert.) The bizarre wish fulfillment and nitpicky social commentary make the big furry hat one of Late Show’s most fun new accessories. To kick off its more philosophical, broader approach to faith and the meaning of life, the new Late Show brought us Big Questions With Even Bigger Stars, in which Colbert reclines on a blanket on the grass looking up at the night sky with people like Tom Hanks, Scarlett Johansson, or Bryan Cranston. Then, they just … talk about stuff. The topics, and some of the answers (Why do bad things happen to good people? Because God has poor eyesight), are more than a bit reminiscent of Jack Handey’s Deep Thoughts and the segment overall can feel tediously scripted, but the dialogue in place of one-liners—and the relatively innovative use of famous people—helps give the segment its own identity. Colbert, a practicing, dedicated Catholic, has long been interested in the role of religion in American life, particularly as one way of answering his Big Questions. Doctrinaire Christianity, after all, was one of the stronger parts of his Colbert Report character. And, in keeping with the generally enthusiastic, inquisitive spirit of his Late Show, All Up in Your Faith allows Colbert to dig into various religions, explaining their rituals and idiosyncrasies for a mass audience. Segments so far have featured Buddhism (and the apparently tenuous succession of the Dalai Lama) and Indianapolis’ Church of Cannabis, which somehow does not feature anyone smoking weed at their services. In response to the tens of candidates running for president in 2016, Colbert started this Hunger Games parody segment, in which, swilling a glass of champagne and wearing a bright wig à la Stanley Tucci’s Caesar Flickerman in the actual Hunger Games, he gives an elegy to each fallen candidate (“tribute”) as he or she drops out of the race. This is one of the most frequently recurring bits on The Late Show so far, because the race has already left quite a few tributes behind, namely Rick Perry, Scott Walker, Jim Webb, Lincoln Chafee, Lawrence Lessig, and Bobby Jindal. Colbert’s obvious glee in ripping into the dead campaigns makes this one of the best recurring bits yet. He gives comic obituaries to the deluded, hubristic, and woefully underqualified candidates, and it’s a great use of Colbert’s satirical skills—playing an oblivious goof while still delivering withering political takedowns. In his first technologically minded recurring segment, Colbert looks at apps that have little apparent reason to exist: for instance, the one solely designed to send marriage proposals that doesn’t take “no” for an answer, possibly mankind’s most romantic invention. Colbert’s interest in the front lines of technological innovation—further evidenced by his choice of interview subjects like GoPro CEO Nick Woodman and Apple’s Tim Cook (people who don’t generally appear as late-night guests)—is part of the defining spirit of the new Late Show. This makes Planet of the Apps feel like one of the freshest recurring bits on the show, especially since Letterman had such a resolute lack of interest in anything to do with online culture. A segment impossible to imagine coming from someone who hadn’t taken Colbert’s unique path to late-night through faux-conservative performance art, “Who Am Me?” sets out to answer a now-ridiculous-seeming question asked by various pundits in the lead-up to the show’s premiere: Who is Stephen Colbert? Is he going to continue to riff on his older Colbert Report character? Be totally himself? Do something new entirely? The segment slyly riffs on the question by allowing Colbert to investigate his own identity. Thus far he’s taken the Myers-Briggs personality test (he’s an INFP) and a polygraph test, but future installments—including interviews with people like his childhood crush—promise to go even deeper. Hollywood has a long history of sucking up to Chinese censors in an attempt to rake in more money from one of the biggest movie markets in the world. This segment finds Colbert shamelessly following in that tradition by, among other things, calling out the Dalai Lama and having his life saved by a Chinese doctor/astronaut. There’s only been one installment of Pander Express so far, but its branding in that initial bit, and the obviousness with which Hollywood goes out of its way to please China, means that even though the first one was a little clunky, the segment should come back soon. It’s just a fresher way of talking about Hollywood and one that avoids the standard late-night posture of … well … pandering. Colbert’s TED Talk parody sends up the self-seriousness and background condescension of the popular “educational” series. The talks Colbert supposedly found in TED’s rejected pile are pointless, long-winded, and delivered by goofy characters, like a wrestler overexplaining the transformation of a “simple, everyday cage” into a “decadent palace of suffering” or a kid describing what he did over his summer vacation. The jokes thus far have been a little hokey, and, like their inspiration, rely on drawing out an idea for several beats too long. (Was anyone really clamoring for a “how can you have any pudding if you don’t eat your meat” Pink Floyd joke in 2015?) But the premise is solid and flexible enough that it’s worth seeing how this one shakes out. Part of the task of the late-night host is to present opinions on the issues of the day, some of which, inevitably, are deeply uninformed. These days, of course, such off-the-cuff bloviation is commonly known as a hot take. As Colbert puts it, “I can either talk, or I can know.” So this segment takes issues like the American prison-industrial complex and reduces them to immediate boos, hisses, and other knee-jerk reactions to complicated problems. It’s like the anti–Last Week Tonight of late-night: Instead of meticulously debunking conventional wisdom, Colbert cartoonishly champions it. And in doing so, he levels a critique of political discourse that might not be as thorough as Oliver’s but is no less cutting. Late-night TV has a generally troubled relationship to the Internet. When these shows are not strenuously trying to generate viral moments, they’re laboring to convince young, tech-savvy viewers that a middle-aged white dude in a suit is worth listening to for 45 minutes every night. Colbert leans into the inherent fustiness of the gig with his investigation of the “online-o-scape.” In Stephen Colbert Gazes Into the InfiNet, he riffs on weird corners of the Internet, from websites he’s discovered to strange Reddit threads. In the first installment, he discovers that there is a community of people who will pay lots of money for dollar bills with weird serial numbers. As with much of his Late Show so far, Colbert’s obvious enthusiasm for the idea (and his bewilderment that such things should exist at all) is infectious and the main reason to keep an eye on this segment. Here, Colbert plays on his Catholicism again—by confessing not-quite-sins to his faithful audience. For instance: the way he gets angry when people don’t care about the difference between sci-fi and fantasy, the fact that sometimes he doesn’t write his own jokes, and his deep and abiding love of The Notebook. On one level, it’s a clever repackaging of the host’s monologue, replacing the news of the day with Colbert’s thoughts and feelings, but it still suffers from the same visual inertness. Hopefully the content of Colbert’s Midnight Confessions will improve as much as his Late Show already has.